Tough, smart business advice from the star of the hit TLCreality show "American Chopper" Now in paperback, The Ride of a Lifetime elucidates thebusiness principles that have made Paul Teutul Sr. and OrangeCounty Choppers a household name. Paul's smart, commonsensebusiness wisdom works for businesses both big and small in anyindustry. Here, he shows you firsthand how he built a uniquelysuccessful business by working hard and demanding it from others;encouraging and embracing unfettered creativity; establishingwell-defined roles for every team member and demanding they supporteach other; and using honest conflict and confrontation to solveproblems and constantly innovate. Paul and his sons build the best one-of-a-kind choppers in theworld with unrivaled passion, creativity, and honesty. The Rideof a Lifetime shows you how they do it. 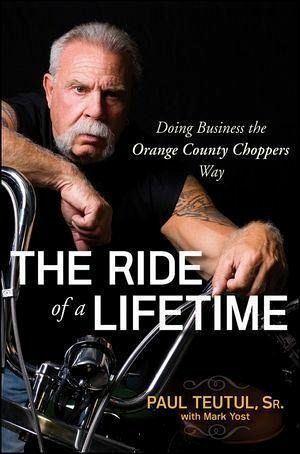 * Offers an inside look at the business practices that builtOrange County Choppers into a massively successful business * Reveals a different side to the OCC family patriarch * Full of practical, real world business principles that lead tounlimited success for any business The Ride of a Lifetime is a smart, tough-as-nails guideto business success that every entrepreneur should read. Paul Teutul, Sr., a veteran of the Merchant Marine during the Vietnam War, is the founder of Orange County Choppers, one of the world's premier builders of custom motorcycles. Since 2002, he and his business have been the subject of the hit TLC show American Chopper. For more information, please visit www.orangecountychoppers.com.